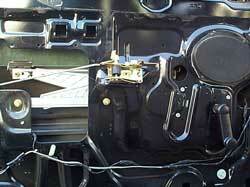 The next step in the process is to remove the manual window regulators from the doors. 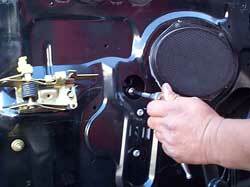 The window is rolled down a few inches so that the nut that holds the channel to the glass is lined up with the hole just to the side of the speaker. 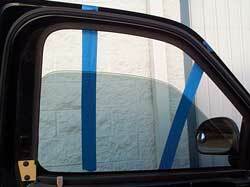 Before removing any of the nuts, we used blue masking tape to hold up the window. We choose to use the long mask tape, because it has moderate adhesive properties that won't damage the vehicles paint and it also has UV resistance, so it comes off easily (even after a couple of days). 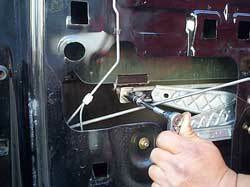 As shown below, the 2 nuts that hold the channel to the bottom of the glass are removed.